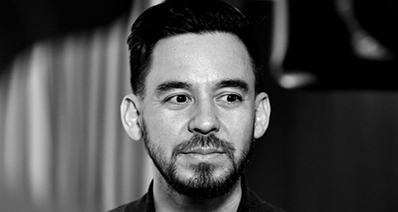 Talking of videos, the first thing that strikes mind is YouTube, which has a huge collection of videos in every possible genre. Playing desired videos online through YouTube is not always possible, and you may want to play these videos offline on QuickTime, especially if you have a Mac system. QuickTime is a multimedia framework that supports Windows as well as Mac, and QuickTime Pro can also be used to convert your favourite videos into slideshows. The YouTube videos are in FLV format, whereas, QuickTime supports all major formats, except FLV. Thus to enjoy your favourite videos on QuickTime, you need to convert them from YouTube to QuickTime readable formats, and for this, a good YouTube to QuickTime converter is needed. Best solutions to download and convert YouTube to QuickTime MOV are listed below. Fortunately, for Mac users, the iTube Studio Best YouTube Downloader is exactly what you want. Apart from being able to download video from YouTube on Mac (macOS Mojave included), this application can also convert the downloaded videos to QuickTime MOV format. 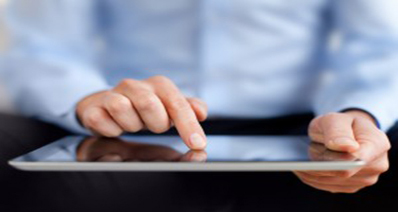 Therefore, you can play YouTube video on your Mac, as well as on your iPhone, iPad, and iTouch. Moreover, besides converting YouTube to QuickTime, this YouTube video converter can also download and convert online video from other video-sharing sites like Dailymotion, Vimeo, Veoh, Metacafe, and so on. 1 click download videos from YouTube, Facebook, Dailymotion, Vimeo, and 10, 000+ sites. 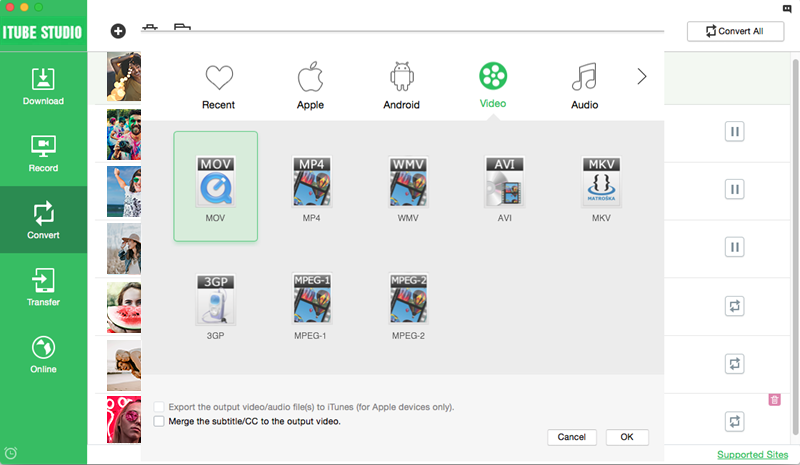 Convert videos to any video and audio formats including QuickTime MOV formats. Preset video download for iPhone, iPad, Android and other portable players. 3 faster download speed and support batch download videos at once. 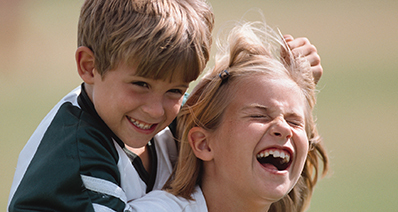 Download videos in high quality and provide options for video resolutions. 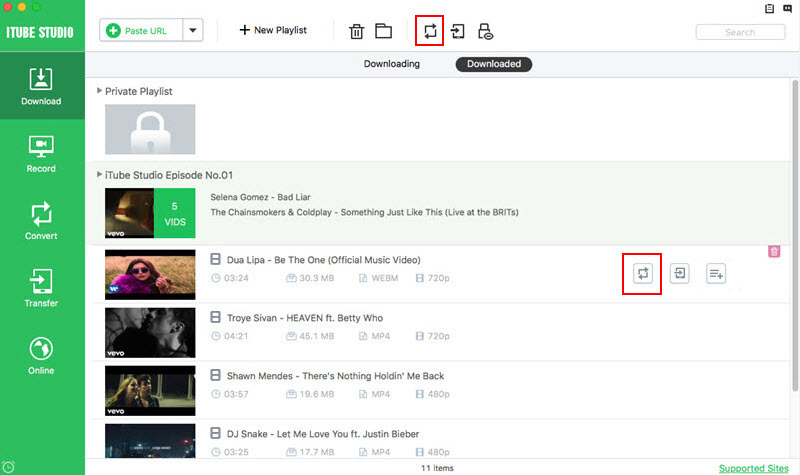 Allows downloading an entire playlist or a channel in batches simultaneously. Private Mode to download videos into a Private List with password protected. This YouTube to QuickTime converter program provides easy methods to save YouTube video to your Mac. First One is that, the intuitive "Download" button allows you to download YouTube video without leaving your browser. 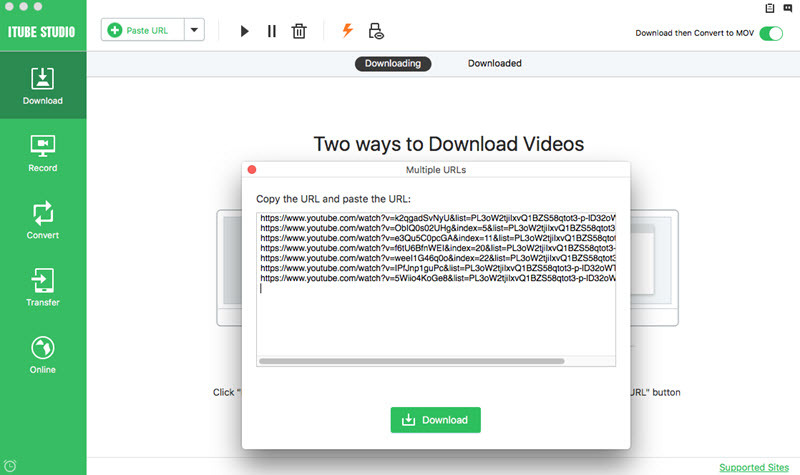 Another classic way is to copy and paste URL to start downloading. You can also directly drag and drop the video URL to the program interface. 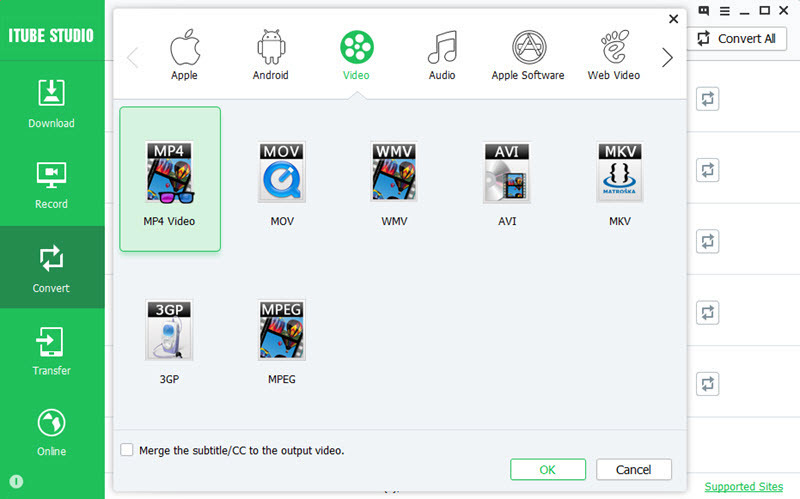 Note: iTube Studio for Mac also allows you to import FLV/MP4/WebM video for converting to other formats. To do so, switch to the "Convert" menu and click the "Add" icon on the top of the window to import and locate existing video files on your Mac. iTube Studio YouTube Converter features a wide range of device profiles, which allow you to convert YouTube to any regular video format. To convert the downloaded YouTube video to QuickTime format, go to the "Downloaded" tab, find the video and click the "Add to Convert List" icon to transfer the video to "Convert" menu waiting for format conversion. Then navigate to "Convert" menu, you can find your video, try to click the "Convert" icon on the right to start the conversion. In the resulting dialog, go to Video category to select MOV as the output format. Click "OK" to start the YouTube to QuickTime MOV conversion. When the conversion complete, right click the video and choose "Open File Location" to open the output folder. By default, the QuickTime Player app will open and then click the "Play" button to start playing the converted YouTube video. You can also firstly open QuickTime Player from Applications folder and then go to File > Open File to locate the converted YouTube file. 1) You're able to play online YouTube video with QuickTime Player. To do so, open QuickTime Player and go to File > Open URL. This method requires an Internet connection and won't save the YouTube video to your Mac. 2) To import YouTube to QuickTime Pro, go to File > Open File, or File > Import. If you want to download YouTube video to QuickTime MOV on Windows PC, you can invite iTube Studio for Windows version. With the help of its built-in browser, you can download video from as much as 10,000 video-sharing sites, including YouTube, Hulu, NY Times, BBC, etc. Besides, you can also convert the downloaded YouTube videos to QuickTime MOV at very high speed with the built-in converter. Let’s see below guide for Windows users. 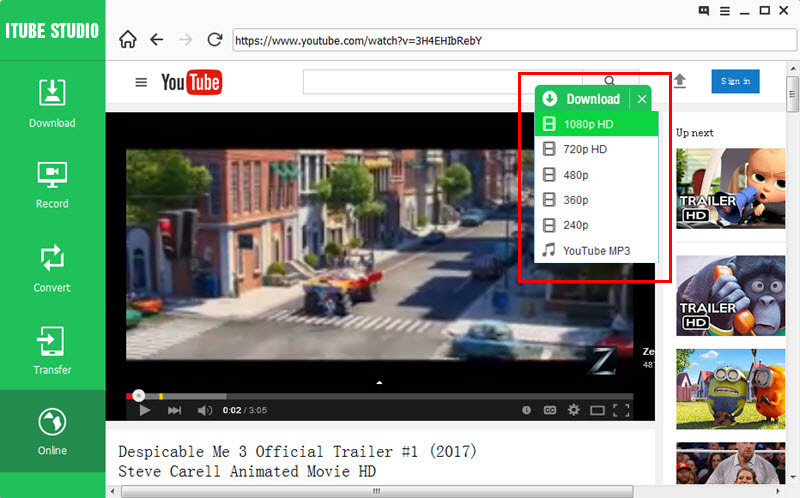 After installing the downloader on your Windows PC, you can click the Online Video tab to open the built-in browser and find your favorite videos from YouTube. When you move your mouse over the video window, a "Download" button will appears on the top right corner. Now you can simple click the button to start downloading video. Note: Alternatively, you can copy the direct video URL and click the "Paste URL" button on the primary window of the program to start grabbing video. You can view the video list in the "Downloaded" tab. Just click the "Add to Convert List" icon beside each video, then you will add the video to "Convert" menu where you can start the conversion process. Next you should go to "Convert" menu and click the "Convert" icon on the right, a pop-up dialogue will show up for selecting output format. You can directly click the Format tab and select MOV as output format. Last, click the "OK" button to start the conversion. Now you are able to get the converted YouTube video worked well on QuickTime. Just take a trial. One of the simplest ways to convert YouTube to QuickTime format is by using an online video converter. Varieties of these converters are available online, and you simply need to enter the URL of the YouTube Video, and it will get converted in QuickTime MOV format. Majority of these converters are quick and free to use. One such decent converter is OnlineVideoConverter, which allows converting YouTube videos to QuickTime and other different formats. Step 1: Open the desired video on YouTube and copy its URL. 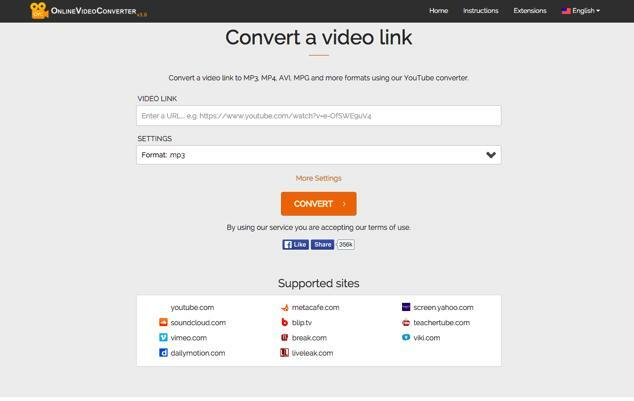 Step 2: Open https://www.onlinevideoconverter.com/video-converter, and paste the URL of the video link. Select “.mov” format and click “Start”. The video will be converted and can be downloaded on your PC/Mac. Being an online YouTube to QuickTime converter, it always needs network to work. Videos can only be downloaded and converted one by one instead of in batch. Local videos present on your PC/Mac cannot be converted. Considering the above features and steps, it can be concluded that iTube Studio is an excellent YouTube to QuickTime converter. You simply need to download YouTube to QuickTime converter and the entire process is quick and simple.